It’s almost Halloween, and once that is over the official countdown to the festive season will begin. Christmas is a time of year which makes people crazy and it is an amazing time of the year to spend time and money on the people you love and enjoy all those naughty treats you ban yourself from throughout the rest of the year. 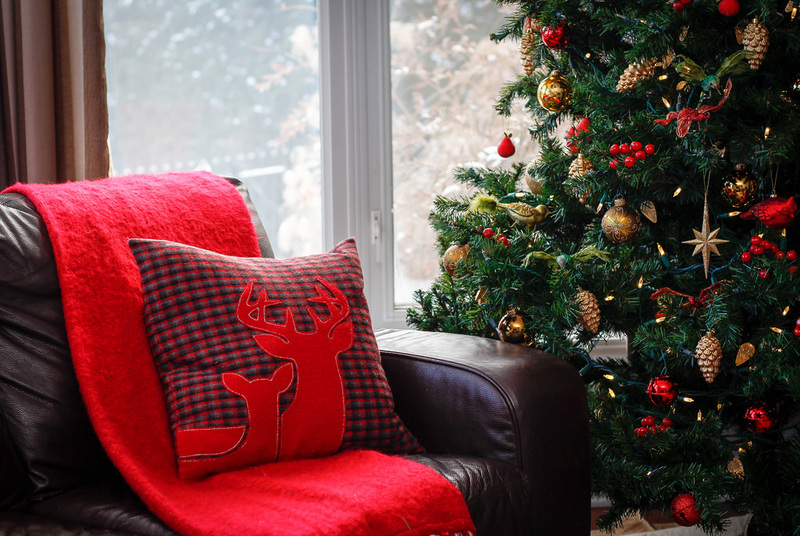 If you are looking to start decorating your home ready for Christmas, here are some of the essential things you can do. Now that the winter is fully here we are all looking forward to wrapping up warm and cozy and beaming able to enjoy hibernating in the bed at the weekend. Make sure that you take this chance to buy some new festive bedding from Asda this weekend and change the sheets to something more bright and cheery for the season. It is a simple change but it will make the whole room feel more festive and cozy when you go to bed at night. A wreath is an ultimate way to welcome people to your home during the winter and it is a fun craft to make by yourself or with the kids this weekend. The first thing you will need to do is find some twigs in the garden and collect them and let them dry out for a couple of days in the house. Once this is done you can arrange the twigs and trim them to create a ring for your wreath. Use a glue gun to stick them together. Optionally at this point, you can spray paint the ring. Now you can use a holly garland, fake leaves and berries, pine cones and other things to decorate the wreath, again using a glue gun to stick them down. Hang on your front door for a cute festive treat! Whether you are thinking of selling your home through real estate during the winter or you simply want the home to look tidier, curb appeal can be a fun thing to play around with. You can mow the lawn, trim down your plants and clean the drive away to make it feel brand new. A fun festive idea is to find some solar powered candy canes and place these in the grass of your front garden to make the entryway feel welcoming and festive for anyone who wants to visit you. Christmas is a time of year where we end up with lots of gifts and we also end up having a lot of mess and clutter from food, drink and everything else. To make this easier on you and to make the time feel less cluttered, make sure to declutter the space this weekend and get rid of things you either no longer want or need. Bear in mind that you will be getting new things this Christmas so some of your older items might not be needed anymore. It will make the house feel fresh and more than ready for Christmas. Now that Christmas is approaching we all know that we will need to put the tree up somewhere in the house. Why not make things easier for yourself and rearrange the room in advance to make a space ready for your tree? The Christmas tree is always the main feature of the home and it can feel really amazing to be able to decorate it together on the 1st December while watching some festive films. If you want the home to feel as cozy as you can during this winter period, the best thing you can do for the space is to add warming colours. Bright red cushions and tartan blankets can be a great way to make the space feel cozy and warm without doing much at all. It will make the home feel more festive and you will be more than ready for the holiday season. Lights are the epitome of Christmas spirit and it is always amazing to have lots of lights in and around the house to enjoy this year. Think about bringing solar-powered lights outside for cheaper magic, and then hang some coloured lights throughout the home and onto your mantelpiece to make the whole space feel magical and festive every day. It will be a great way to help you get excited about Christmas. The home needs to feel warm and cozy during the Christmas period because you will be in the house most of the time during the festive period celebrating with your family. Make sure that you bring lots of candles into the home, add thick blankets and soft cushions to the sofa and chairs and maybe even bring a rug into the room to place over the wood for the winter. All of these things will keep you warm and make you feel cozier during the winter. Colour is the best thing about Christmas and you can really let all of your interior design knowledge fall out of your head for the month of December. Who cares if you have every single colour in the rainbow on the tree? It’s fun! Festivity is all about having fun so don’t shy away from bright colours this Christmas, it will simply give the space some character and make it feel more like a home. The stairway is something which you might not initially think of decorating this winter ready for Christmas but it can be a really great feature for the home and it will help to tie in the rest of the home to your festive downstairs space. Think about wrapping lights around the banister along with a holly garland, this can be a stunning look which is simple but effective and super festive. If you have a fireplace and a mantelpiece in the home this year then you can definitely create a cute festive feature here for the family to enjoy. You can start off with a leafy garland on the mantelpiece and you can place tealight holders throughout to light during the evenings. You can then think about bringing in some fun baubles and other little accessories, as well as hanging a garland which says Merry Christmas along the fireplace. If you want to get into the festive spirit cheaply, an easy way to decorate throughout the house would be to bring in some beads and homemade garlands. You can find lots of Christmas garlands ideas on Pinterest which will give you the perfect tools to make a wonderful feature for the home this December. It will also double up as a super fun craft for you to do with your family this weekend. Who wants a Christmas without a little bit of tackiness? The whole point of the festive season is to our put our inhibitions away and have fun with our design. Sure, tinsel isn’t the most popular thing to bring into the home these days but it can be a super festive and fun addition to your home design and it will make the home feel so much more like Christmas immediately. You will have fun hanging it on the tree and around various parts of the house and you can even make a tinsel wreath for the inside door. Sandra Hayward is a technology freelance writer. She spends a good deal of her time following tech startups, new technologies, and researching existing technology. When she’s not wearing a writing cap, Sarah likes to volunteer at a local homeless shelter in Toronto where she lives. Sarah also likes talking a walk with her dog in the evening. She can’t resist the urge to take her bike out for a spin over the weekends.